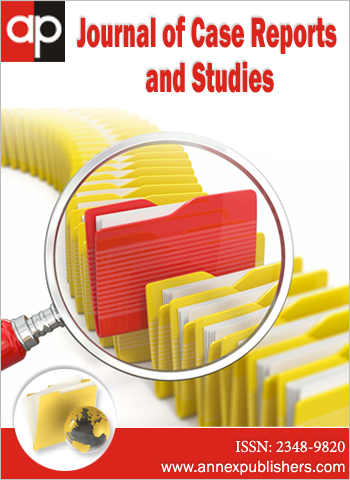 Copyright: © 2016 Habib M. This is an open-access article distributed under the terms of the Creative Commons Attribution License, which permits unrestricted use, distribution, and reproduction in any medium, provided the original author and source are credited. The incidence of complete heart block following Glenn’s shunt is not known. Complete heart block may occur immediately after surgery or early in the postoperative period and also may occur many months or years after surgery. Implantation of epicardial leads was considered undesirable because of the previous thoracic surgery. We present a case of cyanotic heart disease, post Bidirectional Glenn’s shunt. with single ventricle and supravalvular pulmonary stenosis who had symptomatic complete heart block and required permanent pacemaker implantation. A connection between the superior vena cava and the right pulmonary artery is known as Glenn’s shunt. Since the late 1950s, the Glenn’s shunt has been performed to improve pulmonary blood flow in patients with cyanotic congenital heart disease. Venous access to the right ventricle was complicated by the loss of continuity between the right atrium and superior vena cava consequent on the previous surgery . A superior vena cava connection to pulmonary artery (Glenn shunt) is currently the initial surgical step toward creating a total cavo-pulmonary connection (Fontan operation) in patients with a functionally univentricular heart. Subsequently, a total cavo-pulmonary connection is completed by tunnel that directs the inferior vena cava flow into the superior cavo-pulmonary anastomosis. In some patients, the superior cavo-pulmonary connection remains the definitive palliative procedure when completion of the total cavo-pulmonary anastomosis is deemed to be inappropriate. These patients remain cyanosed with inferior vena cava flow returning to the systemic circulation. 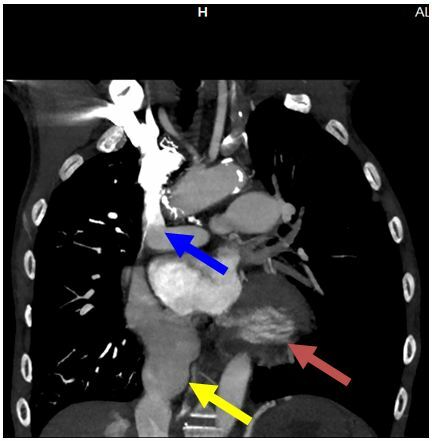 We describe a technique for transvenous permanent pacing in patients with a superior cavopulmonary connection performed with the Bidirectional Glenn operation using the conventional subclavian vein approach and pectoral placement of the generator. A 41-year-old male presented with presyncope attacks and easy fatigability for two weeks. Cyanotic congenital heart disease had been diagnosed at birth. Surgical exploration at 12 years had demonstrated a functional single ventricle and supravalvar pulmonary stenosis. At this operation a palliative Classic Blalock-Taussig’s shunt was created. Another palliative surgery was performed at 21 years of age with the construction of a right atrial-right pulmonary arterial shunt (Glenn’s procedure). After 20 years of Glenn operation the patient presents with recurrent presyncopal attacks and easy fatigability. Electrocardiogram showed complete heart block with ventricular escape rate varying between 35-40 per minute. A decision to proceed to permanent pacing was made. Epicardial pacing appears intuitively as the better way of dealing with it, but the patient denied new thoracothomy. Because the patient high risk of systemic thromboembolism the patient undergoing the pacemaker implantation procedure under medications of Aspirin 100 mg daily and intravenous heparin, after operation we restated warfarin according to INR 2-3. Echocardiography suggested that: Single ventricle, preserved ventricle systolic function, Ejection Fraction: 55%, severe supravalvular pulmonary valve stenosis with maximum gradient 87 mmHg. Grade II tricuspid regurgitation. No connection between superior vena Cava and right atrium. No pericardial effusion. Dilated hepatic vein and inferior vena cava with smoke-like phenomenon. No intracardiac mass, vegetation or thrombus. The Multi-slice Computed Tomography suggested: a right atrial to right pulmonary arterial shunt, severe left pulmonary artery stenosis with poststenotic aneurismal dilatation, severe supravalvular pulmonary stenosis (Figure 1 and 2). After informed consent was obtained and recorded, he was taken to cardiac catheterization Laboratory. He was prepped and draped in usual surgical manner with plan to go for right pectoral implant. 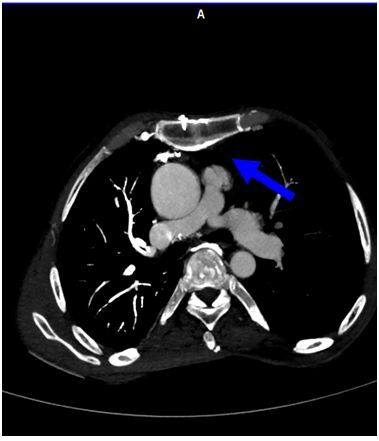 Pre procedure selective venous angiogram was done initially revealed superior vena cava connected to right pulmonary artery (Figure 3). The patient was pretreated by intravenous 2500 U Heparin to reduce the risk of systemic thromboembolism. Right subclavian vein was accessed and an attempt with Terumo guide wire was made to see if right heart access was possible, it passed from SVC to right Pulmonary artery and then to main pulmonary artery and single ventricle (Figure 4). Using 7 French peel away sheath (60 cm, St-Jude medical) with dilator was advanced and difficultly cross the narrowed supra-pulmonary valve to the single ventricle cavity, then we removal the wire and advanced the ventricular lead (59 cm, active fixated, Medtronic, Inc., St. Paul, MN, USA) and screwed at the RV apex (Figure 5). R wave was 15 mm, pacing threshold 0.5 mV and lead impedance 760 ohms. Sheath was peeled off and after creation of right pectoral pocket with sharp surgical incision and blunt dissection device (VVIR, Medtronic, Inc., St. Paul, MN, USA) was connected to lead which was secured to prepectoral fascia with silk suture. Pocket was closed in three layers of absorbable sutures. Pacing following a palliative heart surgery for cyanotic heart disease has a special problem with respect to access to right ventricle. Many patients have to go for epicardial lead placement but epicardial pacing in these patients may malfunction due to high pacing thresholds and early battery depletion. One additional disadvantage of epicardial pacing leads is a slightly higher fracture rate because of the higher mechanical stress compared to endovenous leads . Dual chamber pacing through mini-thoracotomy and transatrial endocardial active fixation lead insertion for epicardial pacing lead malfunction was been reported . A transatrial approach can replace the epicardial stimulation, which would normally be used in these situations and prevents its potential complications. The major disadvantage - like in many alternative surgical approaches - is the complexity of repeated revisions in postoperative complications. In our case the patient refused pacemaker replacement by open cardiac surgery. Eric et al suggested the pacemaker lead can be implanted through the superior vena cava into the right atrium after puncturing the patch with a transseptal needle, the atrial lead was placed in the superior vena cava stump and the ventricular lead is inserted through the patch into the systemic ventricle  this option was not considered in this patient due to lack of previous experience with this procedure. In one case the permanent pacemaker lead was implanted via the inferior vena cava in a case of single ventricle with loss of right atrial-vena cava continuity . The data from temporary femoral venous pacing has been shown to have up to a 30% incidence of venous thrombosis . So that the transfemoral route was not favored in our patient, Transhepatic pacing was another option but was not considered in this patient due to lack of previous experience with this procedure. Fortunately we could access the pacemaker lead through the Glenn shunt and using sheath with dilator over guide wire it could be possible to reach the ventricle and then place a lead at right ventricle apex. We describe a technique for permanent pacing in patients after the Bidirectional Glenn operation procedure using the conventional subclavian vein approach and pectoral placement of the pacemaker generator. The procedure was uncomplicated and satisfactory pacing was established. This is the first case report of pacing in cyanotic heart disease with implanting pacemaker via Glenn shunt was successfully implanted without any complication. At follow-up the patient remains well with an excellent symptomatic response to pacing. 1 Patel MB, Punnam SR, Gupta AK, Murthy KS, Thakur RK (2007) Post Glenn Shunt: How to Pace? Pacing Clin Electrophysiol 5: 672-4. 2 Sachweh JS, Vazquez-Jimenez JF, Schondube FA, Daebritza SH, Dörge H, et al. (2000) Twenty years experience with pediatric pacing: epicardial and transvenous stimulation. Eur J Cardio thorac Surg. 17: 455-61. 3 Sivakumar K, Coelho R (2013) Novel Technique of Dual Chamber Pacing Through Mini-thoracotomy and Transatrial Endocardial Active Fixation Lead Insertion for Epicardial Pacing Lead Malfunction. Ind Pacing Electrophysiol J 13: 170-2. 4 Rosenthal E, Konta L (2014) Transvenous atrial pacing from the superior vena cava stump after the hemi-fontan operation--a new approach. Pacing Clin Electrophysiol 37: 531-6. 5 West JN, Shearmann CP, Gammage MD (1993) Permanent pacemaker positioning via the inferior vena cava in a case of single ventricle with loss of right atrial-vena cava continuity Pacing Clin Electrophysiol 16: 1753-5. 6 Pandian NG, Kosowsky BD, Gurewich V (1980) Transfemoral temporary pacing and deep vein thrombosis. Am Heart J 100: 847-51.